LEXINGTON, Ky. (June 16, 2010) – Physicians, nurses, pharmacists and other health professionals work together in patient care settings each day to treat patients. However, most of them have little or no experience interacting as part of an interprofessional team until they are already on the job. At the University of Kentucky, a new center approved by the UK Board of Trustees, will develop, support, evaluate and sustain an academic culture where health professions students, faculty and staff will work collaboratively as part of their educational experience. 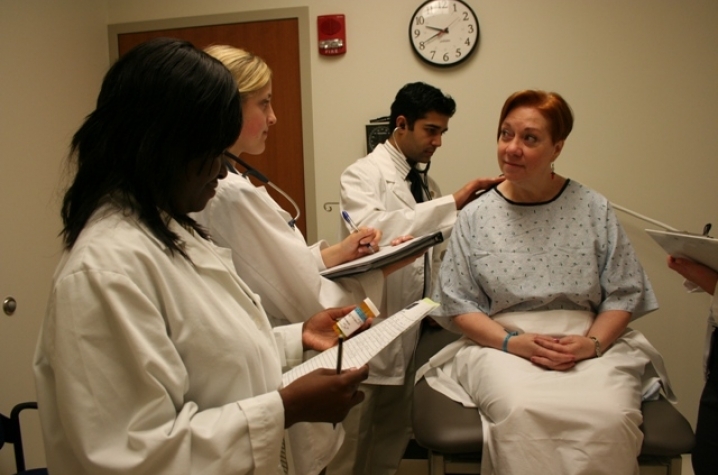 Interprofessional education is defined as occasions when two or more professions learn with, from, and about one another with the expressed purpose of improving the quality of patient care. The new UK Center for Interprofessional Healthcare Education, Research and Practice will be designed to overcome competing priorities and time constraints imposed on students, faculty and administrators that can limit and inhibit these education experiences. "Health educators across the globe have touted interprofessionalism as a necessary approach to health care delivery. More importantly, it elevates quality of care for patients, which is by far and away the guiding force behind this movement," said Dr. Jay Perman, dean of the College of Medicine and vice president for clinical affairs at UK. "With six health science colleges as well as a multitude of other undergraduate and graduate academic programs stationed on one, centralized campus, UK has a distinct advantage to be on the forefront of interprofessionalism." Perman, who will be leaving UK at the end of this fiscal year to become president of the University of Maryland, Baltimore, has been a guiding force in the creation and establishment of the interprofessional center. In 2005, Perman helped lead the effort to formally organize a campus wide Interprofessional Education and Practice Working Group. Starting with two representatives from each of the six academic medical center colleges, the group now includes more than 80 members including students, residents, faculty, and staff from the colleges of Arts and Sciences, Dentistry, Education, Health Sciences, Law, Medicine, Nursing, Pharmacy, Public Health and Social Work. "We know that interprofessional team-based practice leads to safer and better health care and that ultimately means better outcomes for our patients," said Andrea Pfeifle, assistant professor, Department of Family and Community Medicine in the UK College of Medicine and director of the Interprofessional Education, Research, and Practice Working Group. "Having a formalized center at UK allows us to provide the infrastructure to not only support interprofessional activities but also to facilitate a marked cultural shift in how we spend our time in our educational programs." UK's goal in interprofessional education is to teach systems-based, holistic decision-making by empowering students with the knowledge, skills, attitudes and experience necessary to enable them to solve complex problems and address issues that surpass the scope of any one profession. "By teaching students to work as teams and modeling it for them at this stage in their development it gives them the experience and confidence to work in a collaborative setting from day one as patient care providers," Pfeifle said. "Interprofessional education is acknowledging that it really does take a village to provide high-quality patient care."